I made this quilt top the other night, and was hoping to finish the quilt before vacation but time got away from me. The squares are each 5" and I used Freshcut and Amy Butler squares and mixed in a bunch I already had. My goal was to mix stuff up that didn't exactly go together and see if I could make it work. I'm not convinced that I did ... I'm not at all sure I like this, I guess I'm just a very matchy-matchy person ... I don't see how this is the least bit cohesive, it just doesn't "say" anything to me, if that makes sense. I'll still finish it and may put it in my shop, but I think in the future I'll use fabrics that are more similar (to me, at least). Another view here. This is a purse I made for someone I'm going to see really soon. I'm hoping that someone won't read this blog tonight since they rarely have the time and are getting on an airplane in the morning. With my luck she'll hop online tonight! 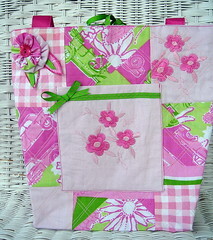 The purse is patched 5" squares, based around a Lilly Pulitzer scarf. I LOVE Lilly Pulitzer. The straps are pink grosgrain ribbon, the accent ribbon is green with pink dots. The fabric is quilted, rather than interfaced ... I'm really liking that look and feel right now. This bag is so preppy ... I may have to make one for myself. It measures about 14" wide by 12" tall and 3" deep. Inside are 2 pockets. Funny (not) story about the flower in the corner. I finished the bag, totally, just had to press it. I set the iron on the fabric and it immediately burned - up in the corner with the flower. You can see the color variations better here. I was ready to cry, but Jason suggested doing "one of those flower things" and it worked pretty well. A view with the straps here. A bag for another someone I'll see very soon. This one I'm not as sure about. I sewed the strips together, cut out the bag, and used the remained for the straps. I love the ribbon on this one. It's about the same size as the one above. My hope is that someone will like it, and stop stealing her Mommy's bags! View the back here, ignore the fact that it looks so pale ... I think I got a bit carried away lightening it the photo. And, lastly, at about 1:00 this morning I came up with the idea of making A and K car bags for the plane, so they can bring a bunch of cars and have a place to store them inside their tote bags. 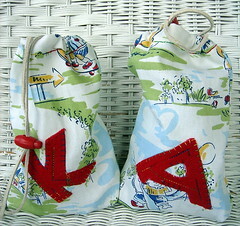 The bags are pretty small, maybe 7" wide by 9" tall. They insisted on having their cars in the bags for the photo, so the bags would look "lumpy" ... apparently lumpy is the way to go with car bags. 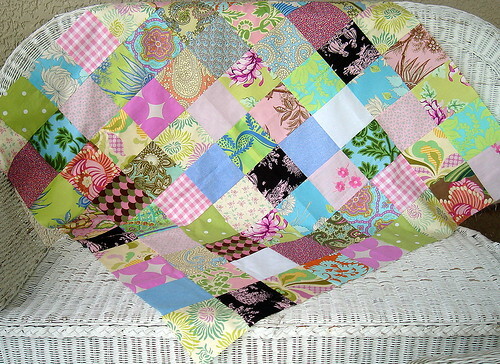 WOw, just fell on your blog and that 1st quilt is absolutely beautiful. I think it's one of the hardest thing to do (that means I tried.. and the results were not.. let's say too great). I'm not a quilt person and I think your "this and that" quilt is really great. I guess I'm not a "matchy" person, because it snagged my eye right away! Thank you! I love when people use not totally matchy stuff and make something wonderful ... I'm hoping it's a skill I can learn. Ooh, I love the colors on that top quilt. 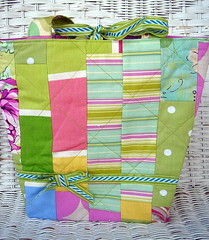 And I'm using the shape of the pink bag as inspiration for a bag I'm making for a craft exchange this weekend. I've enjoyed looking through your blog - found it through Flickr. I love your quilts and ideas. I just stumbled upon your blog through Blogger. I just started quilting and have an old, falling apart sewing machine. I usually make bags and accessories. My machine doesn't have a quilting foot so I usually just use the tie method. Beautiful stuff. i have a question about the bags for matchbox cars, which is a great idea. is that just a straight drawstring bag? And where did you get the red pulls that is holding the strings together?